Here's a deal for Amazon Prime Members! Right now over at Amazon you can score this Frito-Lay Fiery Mix Variety Pack 40-Count for just $10.06 shipped when you clip the 20% off coupon! That makes each bag just 25¢ each! 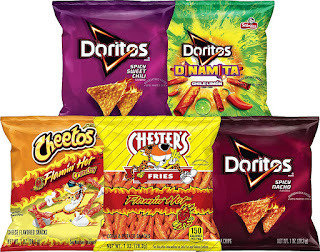 This variety pack comes with eight Cheetos Flamin' Hot Crunchy, eight Chester's Flamin' Hot, eight Doritos Spicy Nacho, eight Doritos Spicy Sweet Chili and eight Doritos Dinamita Chile Limon.